Depression is a mental condition that you experience when you feel very low. You may suffer from grief, helplessness, desolation and even worthlessness. It needs to be treated immediately. Even if you are very sharp and empathetic, once you are caught by depression, it may take toll on you slowly, step by step. You suffer from anger s well as hopelessness and slowly all these negative impacts may lead to several stress-related problems. You can deal with depression in a various ways like medication, psychotherapy and so on. However, meditation is found to be one of the most effective ways to come out of depression. So, let us learn about the benefits of meditation and how it can help you fight depression. Meditation for Depression, what is it? Meditation that you practice to treat depression is known as ‘Depression Meditation’. It focuses mainly on your breathing. You have to concentrate on your breathing and this will gradually make you completely relaxed. It not only relaxes your body, but also your mind. Here is a set of steps that will help you to understand this meditation better. Sit straight on the floor on a yoga mat. The posture you take must be such that you feel comfortable in it. After sitting comfortably, focus on your breathing. Count the number of inhales and exhales that you take. Count it silently. Remember that this is a gentle process and not a forceful one. Increase you focus slowly and try to carry it on as long as you are comfortable with it. This provides you relaxation, which can improve your mood and make you light at heart. So, your grief is reduced slowly. In General meditation technique you enter into a meditative state before there is a severe decline in your mood. The mood swings that you experience during depression depend on its severity. For meditating, wait for your mood to lift a little, so that you can engage yourself in normal activities and you can respond physically as well as mentally. The most important part of this meditation is focusing. So, when you do this meditation, choose a place that is silent and peaceful, away from any distractions like sounds of TV, children and so on. Pulling down the curtains, outing ‘Do Not Disturb’ board on the door, placing earplugs on your ears or listening to soothing music can help you focus easily. Another important thing when you do meditation for depression is to feel comfortable while doing it. The most relaxed and comfortable position for general meditation is sitting cross-legged on the yoga mat. You may also sit on a pillow, chair or bed, whichever is comfortable for you. You must also take care to dress comfortably, as it plays an important role in meditation. Do not wear tight clothes. Wear loose and comfortable clothes. Try to relax by breathing normally. Focus on your diaphragm muscle. This increases the flow of oxygen within your body, thus supplying it to all parts of your body. This will help in relaxing the different parts of your body like torso, neck and the shoulders. By keeping your eyes closed, you will be able to focus more and thus increase the level of meditation. Concentrative meditation: This enables you to concentrate on a particular experience. It can be pronouncing a word with full concentration or hearing a sound. You have to focus on it fully. This is very useful for those who are new to meditation and helps in increasing their concentration. Guided meditation: When you practice this meditation, you have to imagine that you are seeing a natural landscape, which brings absolute comfort to you. Start from a single aspect of focus and then you can extend your experience. Mantra meditation: Mantra is a word that you pronounce again and again as you meditate. It is very effective for making you relaxed and calm. Uttering this word continuously during your meditation helps in making you free from all negative thoughts and perspectives of the world and gradually uplifts your mood. Meditative walk: Meditative walk focuses not only your breathing, but also on the movements of different limbs. The destination is not the important part in this process. Mindfulness Meditation: This begins with focusing on breathing. Gradually you have to pay attention to the rest of your body as well. You have to do it in such a manner that you should be able to admit your emotions at last, without being judgmental. This is the most complicated process of Depression Meditation, yet the most effective process of all. When you are depressed you suffer from various symptoms like extreme unhappiness, lack of sleep, excessive loss of energy and even repeated suicidal tendency. It becomes a hard task to cope up with all these emotions. 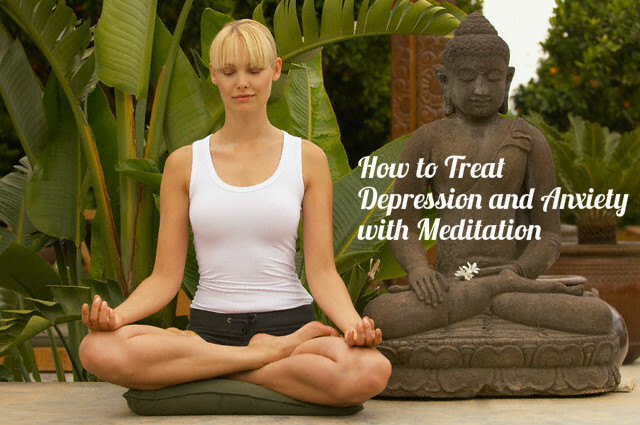 It has been seen that by performing meditation, you can reduce depression. So, with regular meditation, all the symptoms of depression will gradually be withdrawn from you and you will feel normal again. Meditation is great for relaxing your body and mind. It has great influence on your brainwaves. As a result, the grief, anger, anxiety etc that you had felt will be regulated. This way you will be able to keep calm and contented throughout your life. Those who practice meditation regularly experience less anxiety. Meditation also decreases your dependence on medications and improves your mood and productivity. It is important that you practice meditation constantly if you want to get rid of depression forever. So, follow the steps given above ad lead a balanced and healthy life that is free from depression.